The quarterly meetings of the New York Allergy and Asthma Society are among the highlights of my allergy year. The January meeting was packed to hear Dr. Mirna Chehade, Associate Professor of Pediatrics, Allergy and Immunology, Medicine, and Gastroenterology at Mount Sinai talk about EoE. One measure of the level of interest in this poorly understood disease was that many marquee names in IgE-mediated food allergies were present. EoE is a “new” disease. As I have said elsewhere, my copy of The Atlas of Allergic Diseases, which was published in 2002, doesn’t even mention it, although it does mention eosinophilic gastritis. The recent vintage means that there is no old data. Adult EoE patients have no childhood history of the disease because it simply wasn’t studied. Dr. Chehade believes that there are other clues—a history of picky eating or “textural issues” may have been tipoffs, and indeed those behavioral adjustments by children today may point an observant doctor in the right direction. She told of a child who was getting plenty of calories but they were disproportionately from things like cheesecake and other soft foods. One clue: this child would eat bread but he would always dunk it in whatever he was drinking before he would put it in his mouth. 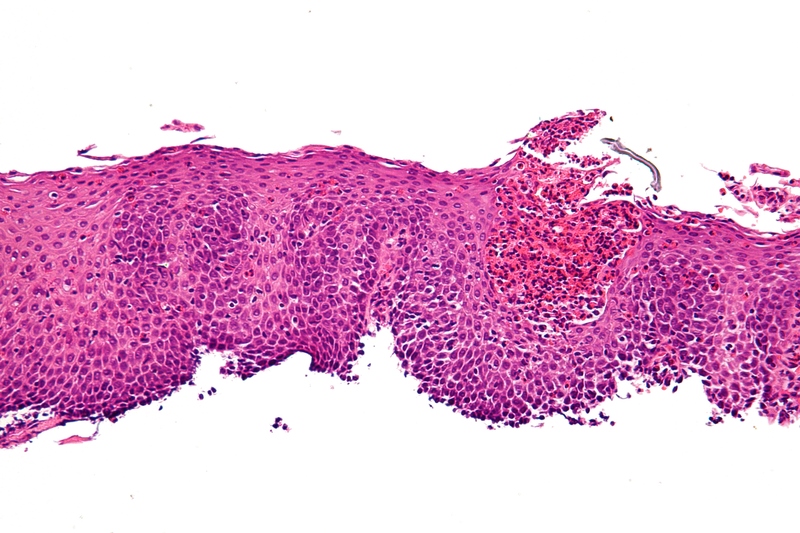 Scoping showed a narrowing or “stricture” in his esophagus. Another behavior clue is taking a drink to wash down each mouthful of food, no matter how well chewed. I wish I could report some breakthroughs in diagnosis and treatment. Most of what I heard underscored the impression that this is a little understood disease—hard to diagnose without invasive scoping and multiple biopsies, and few good options for treatment. 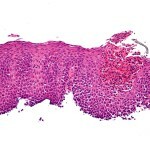 Those scopes show plaques comprised of spent eosinophil granules, furrowing, and constrictions that are pretty distinctive, although by no means the worst thing I’ve seen on the big Harvard Club screen while fighting my way through a chicken dinner. Dr. Chehade pointed out that even in severe cases, the eosinophils may be very unevenly distributed, and it may take several biopsies to find any. There are two basic approaches to treatment, and nothing very novel about them to anyone familiar with the broad spectrum of allergic diseases. One is to do an elimination diet of a range of foods, wait till the symptoms subside, and then add them back one at a time. Milk is by a large margin the one that results most frequently in a relapse. After that it’s soy followed by the usual food allergy suspects. The other treatment is steroids like the ones used to treat asthma. In fact they are the ones used for asthma, only instead of spraying them into the mouth and inhaling, because the drugs aren’t approved for use in this fashion the patient catches the spray in the mouth and swallows. The disease is new and the incidence is small enough that drug companies haven’t invested in the required studies for specialized formulation. Why one treatment or the other? Dr. Chehade leaves it up to the patient. After describing the pros and cons, she asks the patient to choose the one he is most likely to comply with. If it’s easier to restrict what he eats, or if there is fear of steroids, the elimination diet it is. If the patient has trouble controlling what he eats and wants quick results, then it’s medication. With these regimens as in so much of allergic disease, compliance is crucial and Dr. Chehade says she doesn’t want patients to do anything that’s too hard for them. She will not do both treatments at once, however. The results for each are roughly comparable, so there’s no likelihood that doing both will improve the outcome. Furthermore, they wouldn’t know if one was ineffective. Finally, complying with one daily protocol is hard enough. Managing two will be harder still. Only if the first fails will they try the second. THank you for this encouraging article. My 11 year old son was just diagnosed by endoscopy in December and though we’ve had Dr appts, they were more “doomsday” than encouraging. I feel hopeful with what you’ve written here. We began with the steroid inhaler, swallowing puffs, last week. THANK YOU.